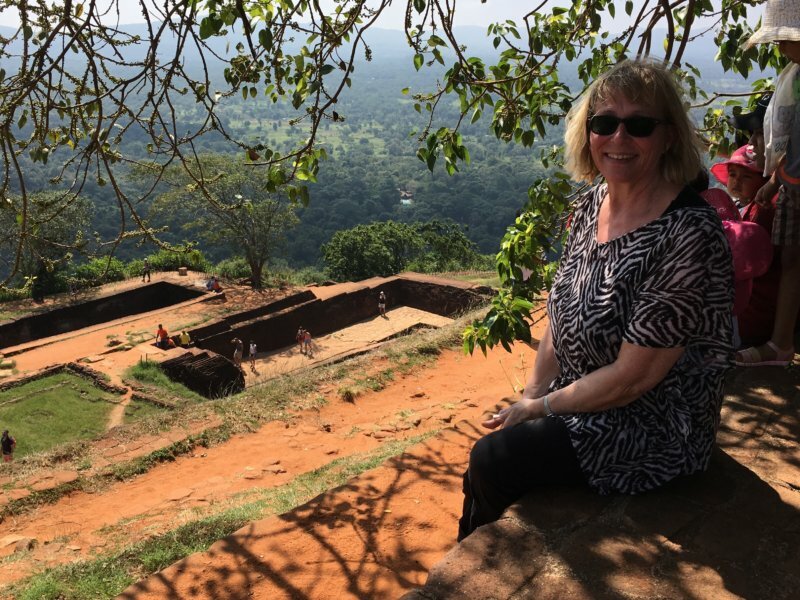 We took two weeks off from the European winter, me and Clas my husband, and traveled down to tropical Sri Lanka just north of equator. 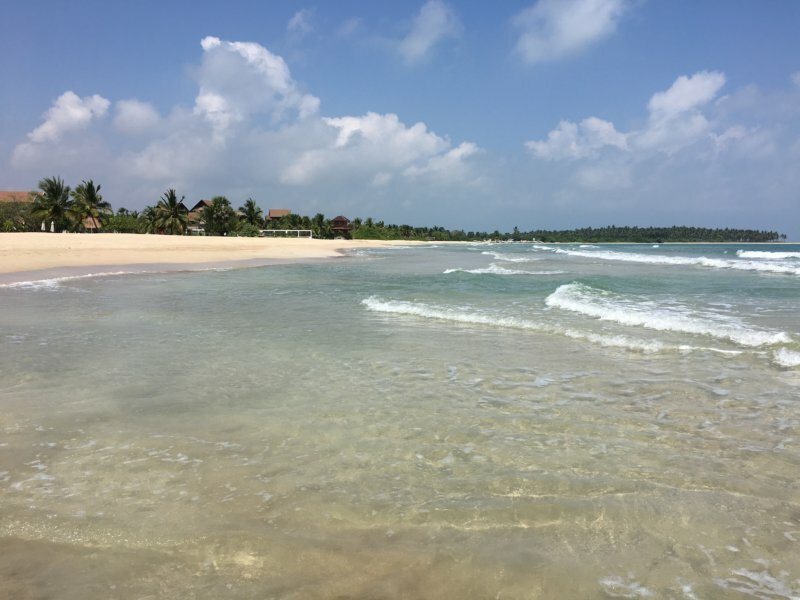 We didn’t know much about this lush, green island in the Indian Ocean neither did we have good ideas on what to see in Sri Lanka. Only a handful of all the people we know had been there but we sorted it out. Now we know a lot and I can tell you what you can see in Sri Lanka in two weeks. Sri Lanka is still one of those off the path tourist destinations, after all the troubles there have been in the past years. First there was a decades long civil war and then the 2004 tsunami that hit the country hard and took the lives of 50 000 Sri Lankans. Today Sri Lanka is building up its economy and charter flights and hotel chains are slowly returning to West and South Coast resorts. Day trips are made inland to historic sites and safaris arranged to national parks. As we wanted to see more of this new, fresh destination than just the coastal tourist strip we toured two weeks around Sri Lanka, driving more than 1600 km in all. We did it by car, but we didn’t drive ourselves. 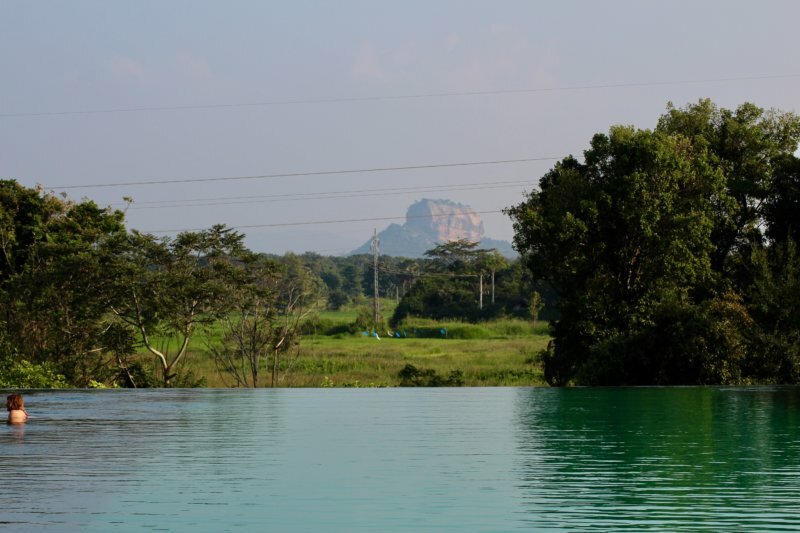 Sri Lanka is one of those countries where many travelers choose to take a car and a driver for their stay – and relax on the back seat without bigger concerns about the chaotic traffic. Yes, the traffic is chaotic and at the same time well organized, it’s just that they behave so differently in traffic than we do in Europe. So what is there actually to see in Sri Lanka? Now I know it, I have been there and found it out for you. Fist of all, there are the sandy, pristine beaches backed by coconut trees all around the island, and most travelers come for that. Sri Lanka is a very good beach destination and the air and water are pleasant and warm throughout the year. We saw a lot of beaches and gradually found out that the best beaches exist in the east. The rural East Coast has white, wide and undiscovered beaches, and it has a lot of them. You can almost have a beach on your own which is real luxury! Then there are the jungles. The inner part of Sri Lanka is mostly jungle, thick green jungle with lots of wildlife like monkeys, birds and elephants. There are really so many different birds! You can hear their sounds best in early morning when it’s still misty before the heat. In a tropical climate the jungle grows and grows so after all the centuries the Sri Lankan jungle hides in it many ruined kingdoms. I have to admit didn’t know how great history Sri Lanka has. Sri Lanka is a country with thousands of years of history. Its ancient kingdoms and capitals were all located in the Central Highlands. The first kingdom was Anuradhapura, the second Polonnaruwa and the third Kandy. All these ancient kingdoms rose and fell and were hidden by the thick jungle until they one after one were discovered in the 19th century. Today the area where all these kingdoms existed is called the Golden Triangle. And more ruins exist on the top of Sigiriya Rock. And then there are all the temples. Sri Lanka is a country with four main religions. There are the Buddhists, Hindus, Muslims and Christians all of which have their own temples scattered around the countryside. Buddhist statues often shine with gold, Hindu temples are decorated with magic pastel shades and mosques and Christian churches too have a lot more color than we are used to. What did we eat in Sri Lanka? We had local dishes every day, Sri Lankan food it’s so good. It’s based on rice and curry: exotic fruits, beans, vegetables, chicken, fish flavored by curry that they mix themselves. We noticed that the menu is basically the same in first class restaurants and simple village eateries, and in both places Sri Lankan food always tastes good. First it tastes very spicy but after a few days we learned what the spiciest things were and took less of them. I lived two weeks on Sri Lankan food, every day, lunch and dinner. I always preferred local meals if they were served but Clas sometimes wanted more international flavor and more meat. But let’s get back to nature: as Sri Lanka is in the tropics it has plenty of exotic tropical wildlife. Elephants, monkeys, wild buffaloes, leopards, lizards and snakes, sloth bears and birds in all colors. Peacocks don’t appear in zoos, the are wild and you can see (and hear) them all around the country. There are so many peacocks that one of the airports had to close down since peacocks caused problems to air traffic. However the best places to meet local wildlife are the national parks that there are more than 20 of in the country. These national parks all together make vast protected jungle, dry zone and wetland areas where increasing population and traffic don’t affect wildlife as much as it does elsewhere. Watch up for elephants in traffic! You have to watch for elephants, and you have to watch for people and domestic animals when driving though villages. Sri Lanka is a small island but has 20 million inhabitants. The biggest city Colombo only has a population of 600 000 which means that there are villages after one another on all roadsides. People live in the countryside, in villages. That makes driving very very slow, village traffic consists of people in all ages and all possible means of transport. There are cows, dogs, buffaloes and even lizards on the road. Our medium speed was 30-40 km/hour in areas with a lot of villages and 40-50 km/hour in mountain areas. 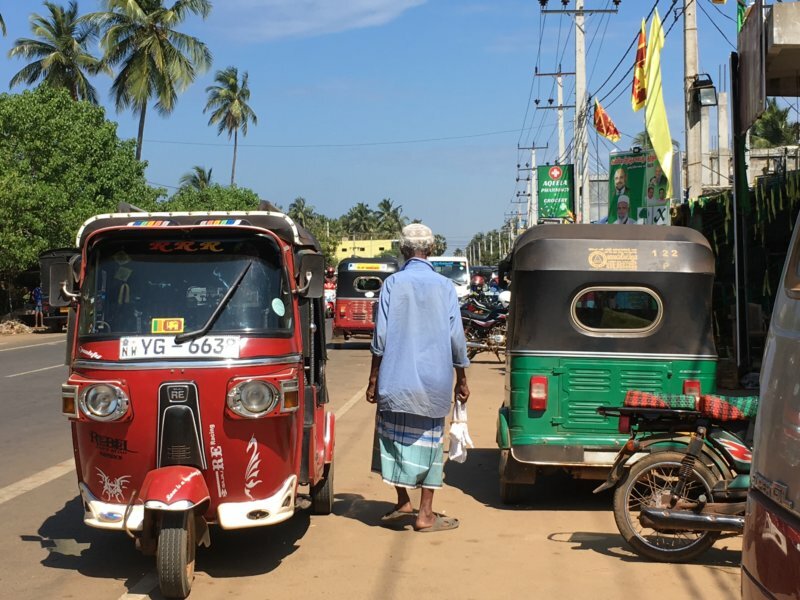 Tuk tuks are a very common mode of transport, maybe not in Colombo but in all countryside. There are 1,2 million tuk tuks in all, imported from India, all the same model but in different colors. As we toured the country we met so many people and talked with them. Our experience is that Sri Lanka is full of nice, smiling people. And almost all of them speak English so go ahead and have a talk with them and you will learn a lot. To get to know a country you have to know its people, at least a little bit. It is easy in Sri Lanka where the locals are so nice. This is in brief what we saw on our two week trip around Sri Lanka. So where did we go then? You can see our Sri Lanka travel route on the map. First north from Colombo where the main airport is, then east to the Center and on to the East Coast, down the East Coast, back west to Polonnaruwa and Sigiriya and south to Kandy and across mountains to Nuwara Eliya. Then all the way down to Tissamaharama and Yala National Park in the south and back to Colombo all the way along the coast. And how did we do it? It was a very simple. We bought flights to Sri Lanka. As it turned out to be too demanding to find direct flights to Colombo from Scandinavia we took a connection over Dubai that has fast and reasonably priced connections to Colombo, many times a day. Our round trip again was arranged by a local travel agent Connaissance de Ceylan based in Colombo. They turned out to be real experts of their country. They planned our Sri Lanka routes, arranged our car and driver and found the hotels on the way. It was not a small task, it was ten different hotels and you need to know the appropriate driving times between them. Driving times in Sri Lanka traffic are not exactly what Google Maps tells you. Connaissance de Ceylan also told us which sights to visit and where we should stop for lunch. Super easy – for us! Normally when we travel I’m doing all the planning job myself but why not do it this way? It was a good idea to trust a local expert, not least when we wanted to see most of Sri Lanka in just two weeks. The program was heavy but it gave us a lot. Here is a link to the Connaissance de Ceylan website where they show example trips to give you ideas and help you define what you want, but most trips they arrange are partly tailor made like ours. We used a large range of hotels, from homestay and beach villa to luxury resorts which was good too. The main thing with accommodation is that it’s clean and air conditioned and you get a shower after a day in traffic in a hot country. My separate posts are going to show you different parts of Sri Lanka. Reading them you can follow our two week trip around the tropical island. The second post will be about Central Sri Lanka where we will explore Sri Lanka’s ancient cities. Back to the central highlands and Kandy. For Kandy check out my post Historic Kandy: Temples, Lake and Rainforest Hills. And last but not least, Sri Lanka’s South Coast, from Yala to Galle. See you, with a smile! was this trip in 2018? I a trying to get an idea how current this information is. Hi Daniel. Yes the destination is amazing. The trip was in February 2018. How did you get the driver? Was this prearranged? Maybe if you could share the driver Mac’s phone number, I can check with him. Hi Daljit, the trip was prearranged with the travel agent Connaissance de Ceylan. You can find a link to their website in my Sri Lanka posts.